Stocks appear to be waffling a bit lower in the early going this morning with most of the focus on the happenings in Washington. And with traders waiting for the earnings parade to begin, this appears to be a good time to continue our exploration into the "alts" - I.E. alternative investing strategies. To be sure, the alt space has been hyped as the next big thing in the investment business. The idea is to utilize both alternative asset classes as well as alternative approaches to traditional asset classes in one's portfolio. The goal is to produce returns that are purported to be uncorrelated to the stock and bond markets. Sounds good, right? I've often heard the category referred to as the "last frontier of investing. But to be fair, the idea of putting some "diversifiers" into one's portfolios is actually as old as the hills. In the old days, investors would carve out a small portion of their portfolios and include some gold. Then as time passed, commodities were included in the mix. And then REITs became a popular alternative - so popular in fact that the category now has its own S&P 500 sector. More recently though, the alt space has expanded into untraditional areas such as L/S Equity, Managed Futures, Options, Arbitrage, etc. So, for starters, I wanted to explore how what I call the traditional alts compared to the standard asset classes – i.e. the stock and bond markets. I wondered why investors had strayed from the old-school alts and over time have embraced all the sophisticated new-age alt strategies. I first looked at how an equally weighted combination of the "traditional alts" would have fared over a period of time and compared them to the traditional stock and bond markets, as well as the good 'ol 60/40. In the table below, I use the Vanguard REIT ETF (VNQ) as a proxy for REITS, the Powershares DB Commodity Index ETF (DBC) as a proxy for commodities, and the SPDR Gold ETF (GLD) as a proxy for the gold market. Don't look now fans, but REITs provided a cumulative return slightly better than the S&P 500 and the GLD's return wasn't too far off the pace. And both beat the venerable 60/40 stock/bond allocation. Not bad. But, man alive, look at the commodities returns. Can you say U-G-L-Y? Since I am a big believer in diversification by methodology, strategy, manager, and time-frame, I naturally combinded the three categories to see how a diversified approach might look. The combination of REITS, Commodities and Gold would have produced a cumulative return of +70.31% over the period shown. This despite the brutal bear markets that occurred with all three classes during the period. While the ride would have been exceptionally bumpy in 2013-2015 due to the collapse in oil prices, I did note that the traditional alt combo would have outperformed the bond market (Barclays Aggregate Bond Total Return) over the period. However, the combo did not outpace stocks or a 60/40 allocation. At first blush, it would appear that a combination of these traditional alternatives was worthy of consideration for investors. However, if one looks closely at the returns, the issues become clear. First, REITS and Commodities did not provide diversification benefits in 2008 as both proxies fell precipitously. No, only gold and bonds did their jobs during the credit crisis bear market. 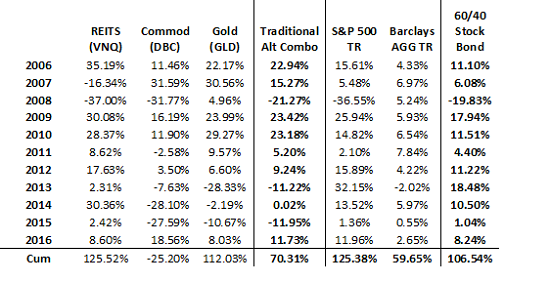 In addition, take a look at the returns of the DBC and GLD from 2011 forward. Ouch. With the DBC showing a cumulative return of -25.2% over the 11-year period and gold losing -21% since 2011, it is little wonder that investors began to look for alternatives to the traditional alternatives! With this base-level assessment in hand, I then wanted to explore what I will call the new-age alternative categories. I found that Morningstar has a Multialternative Category benchmark and a Long-Short Equity Category benchmark that are published back to 2006. I also found that Credit Suisse has a Managed Futures Index that began in 2011. As such, I felt these provided solid representation of the various classes of new-age alts. In reviewing the returns of these benchmarks through the end of 2016, the eye-opener for me was the realization that the performance of both the Morningstar Multialternative Category Benchmark and the Morningstar L/S Equity Benchmark is shockingly weak. 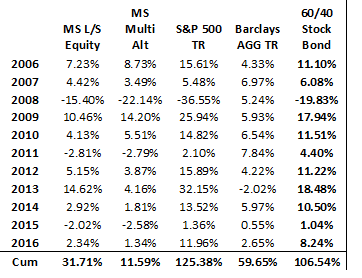 Since 2006, the cumulative return for the Morningstar Multialternative Category is just +11.59% and the return for Morningstar L/S Equity Benchmark is +31.71%. Compare this to the results of traditional asset classes over the same time frame: S&P 500 TR +125.4%, Barclays AGG +59.7%. However, I knew that there was more to the new-age alt space than these two categories. So, I then added the managed futures into the mix. On the surface, this class sounds like it would have promise as managers can literally invest in just about anything. And since the managers also purportedly have the ability to sidestep the stuff that isn't working, this particular area of the alt space has received an awful lot of hype. In the table below, I have used the CS Managed Futures Index published in Morningstar as a proxy for the space. Unfortunately, for the six-year period from 2011 through 2016 (chosen due to the inception date of the CS Managed Futures benchmark), the returns were not significantly different from the other two categories. Bummer. I also created a combination of the three new-age categories in order to see if some diversification might help. Alas, all three categories plus the combo underperformed stocks and 60/40 by a wide margin. However, this is not the end of the story. Remember, alt returns are supposed to be uncorrelated to the stock market and should help investor weather storms. In addition, many alt experts contend that alts should really be viewed/used as alternatives to bonds. So, tomorrow we will continue our exploration. At the time of publication, Mr. Moenning and/or Sowell Management Services portfolios held positions in the following securities mentioned: GLD, VNQ. Positions are subject to change and may be bought or sold at any time.